Culms: Erect, slender, slightly flattened, glabrous. Blades: Flat or folded, narrow, 2 to 10 inches long, to 1/4 inch wide, mostly glabrous; tips boat-shaped. Sheaths: Conspicuously veined, glabrous or rough, lower 1/2 united. Spikelets: Crowded at ends of branches, 3-6-flowered, to 1/4 inch long, nearly as wide, flattened; glumes nearly equal; lemmas with tuft of silky hairs at bases; awns absent. Habitat: Meadows, fields, open woods, overgrazed pastures, and disturbed sites. Forage Value: Kentucky bluegrass provides good early-season livestock forage and withstands heavy grazing, but it is not drought-tolerant. Many wildlife species eat the seeds. Comments: Strongly rhizomatous, mat-forming. Kentucky bluegrass often is used as a lawn grass. 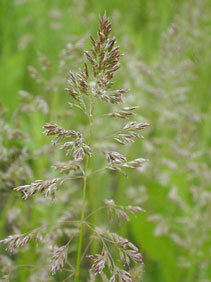 Its pollen causes late spring allergy symptoms.